Twix® Fun Size™ Bars. Perfect for snacking! Milk chocolate cookie & caramel. What's inside calories 80 4% DV per pack. Mars Real Chocolate®. What's inside: Per fun sizes® pack. Calories 80 4% DV. Total fat 4g, 6% DV. Sat fat 2g, 10% DV. Sugars 8g, *. Sodium 30mg, 1% DV. GDA's are based on a 2,000 calories diet. To learn more visit www.marshealthyliving.com. *No DV defined. A little fun Anytime®. We value your questions or comments. 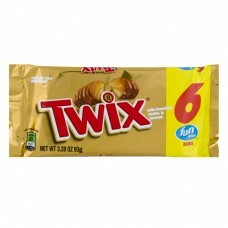 Call 1-800-551-0907 or visit us at www.twix.com. Please save the unused product and wrapper. twix.com. ®/™ trademarks. ©Mars, Incorporated.